1. 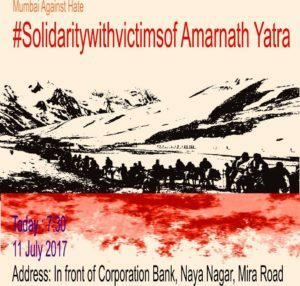 Dharna to condemn terror attack on Amarnath Yatra Hindu Devotees. Azad Maidan, 4pm, 12/7, Wednesday. Javed Anand, M A Khalid, Noorjehan S Niaz, Feroze Mithiborwala, Nuruddin Naik, Furqan. today at 5:30 pm at Pratap Park, Lal Chowk, Srinagar. 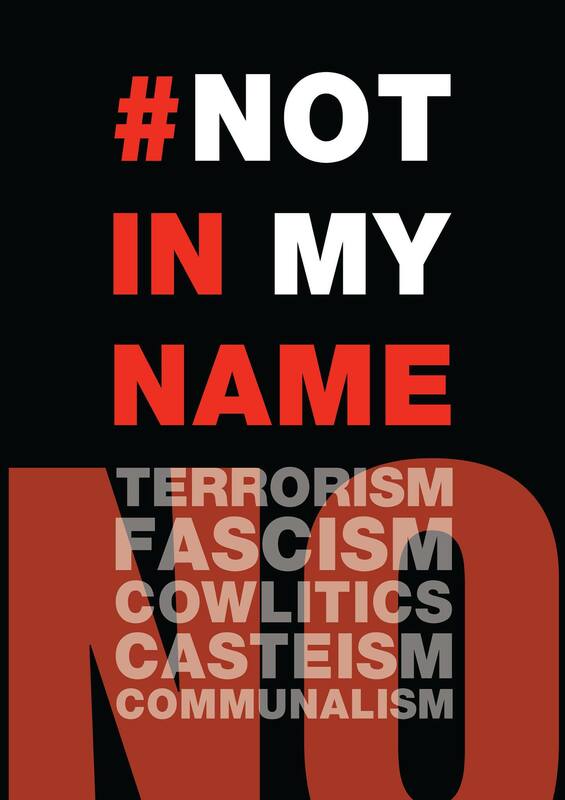 Let us unambiguously & emphatically show solidarity towards those killed and demand a credible investigation against this and all other crimes perpetrated in Jammu and Kashmir. We are saddened by the news that seven pilgrims on their way to Amarnath have been killed in an attack by people who can only be described as enemies of humanity. The Kashmir police has issued a statement that the attack was on a police van and the yatris died while the fleeing attackers fired indiscriminately. The Amarnath Yatris have never feared an attack even when the situation in the valley was worse than what it is at present. Kashmiri people have always taken pride in the fact that the Yatra was always safe and never came under any threat. It is tragic that this faith and trust today stands shattered by elements who obviously want to kick start a chain of incidents that will bring more tragedies, more deaths and more hatred. We as citizens have to intervene in this situation and mourn the death of those civilians who unexpectedly became collateral damage and also take a firm stand against politcal violence no matter who the perpetrator. Kashmiris in the valley have been caught in a vortex of violence and it is not too long back that we saw all those disturbing images of young people carrying pellet wounds over their bodies. All lives matter and dead bodies should not become part of a politcs that divides people on the basis of religion. The seven dead did not deserve to die and it is only when we stand up and demand an end to this politics of hatred that we can prevent the deaths of innocents going on a pilgrimage or returning from Eid shopping. We request your participation or your representatives to do the coverage of the event. 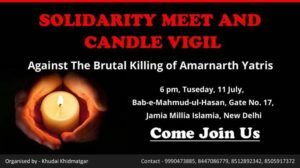 The candle vigil will be held at Babe-Mahmoodul Hasan Gate no-17, Jamia Millia Islamia, Jamia Nagar, New Delhi. Shree Prakash N. Shah, the President of Peoples’ Union of Civil Liberties, (PUCL) Gujarat chapter, Shree Gautam Thaker, the General secretary of PUCL Gujarat, Shree Dwarika Nath Rath, the Secretary of Movement for Secular Democracy (MSD), have issued the following statement condemning the terrorist attack on Amarnath pilgrims-“We strongly condemn the dastardly terrorist attack on the Amarnath pilgrims and express our condolence to the families of bereaved. Apparently proper precautions from the travel organisers and security measures might not have been taken adequately but that is not the only issue for what has happened. The attackers simply do not want to understand that what they do is simentanously tearing up the social fabric, also economic life line of people of Kashmir. भारतीयो सिर्फ कँन्डल मार्च ही नीकालो…. नेतावोपर ईसका कोई असर नही होता क्योकी नेतावोपर गुजरती नही..